» 12/05 Thinking of the Children: Where to from Here? 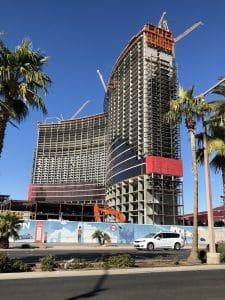 On a brisk December morning, the $4 billion Resorts World Las Vegas development was abuzz with activity. Along the Las Vegas Strip, onlookers could spot four cranes lifting pieces of construction material into place for the S-curved towers. From the roof of Circus-Circus Las Vegas’ parking garage, the podium for the casino and other public amenities can be seen taking shape. Portions of the high-rise are already affixed with bronze and reddish-orange glass, and hundreds of construction workers were spotted throughout the complex. Unlike builders of previous Las Vegas Strip mega-resorts, who touted construction milestones and promoted achievements, Resorts World’s Malaysia-based owner Genting Berhad is the Marcel Marceau of casino developers. 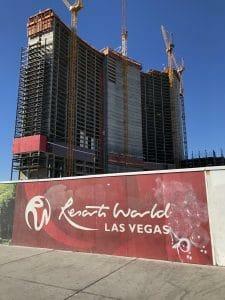 Resorts World spokesman Michael Levoff, who is based at the company’s New York City casino, said Genting is “deliberately being tight-lipped” when it comes to Las Vegas. The Las Vegas Strip has not seen the ground-up development of an all-new mega-resort since Cosmopolitan of Las Vegas opened in 2010. Excitement, speculation, and rumors – the first phase of Resorts World is expected to consist of 3,400 rooms – are protocol in this city. Last week, Genting Berhad said more about Resorts World Las Vegas than has been revealed in the last 18 months. 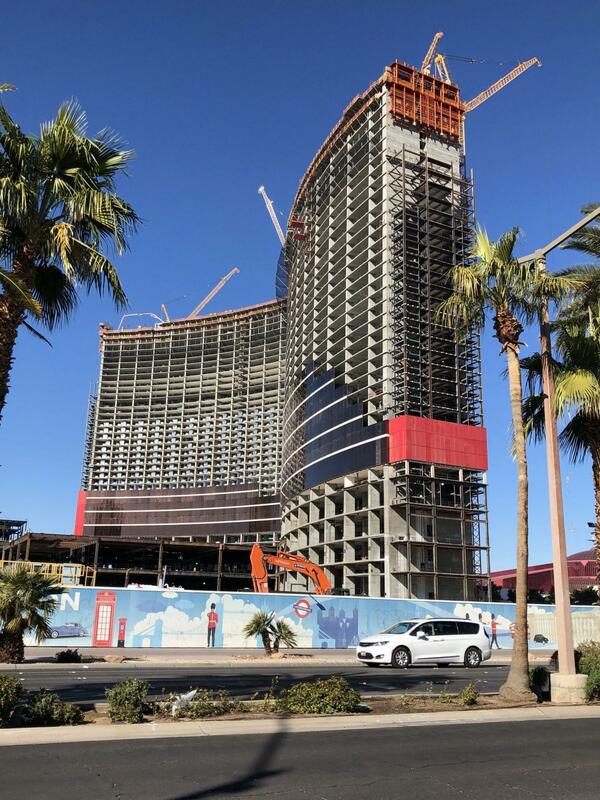 Through a footnote in the company’s third quarter earnings release, Genting said construction was “progressing well.” Concrete had been poured for the 39th level of the west tower, while work had reached the 36th level of the east tower. Each tower will eventually reach 60 floors. Development and land costs incurred were approximately $1 billion as of Sept. 30. “(Resorts World Las Vegas), an iconic must-see luxury destination resort, is designed to appeal to a wide array of domestic and international tourists, as well as business and leisure guests,” the company stated, saying the first phase was targeted to open by the end of 2020. Said Levoff, “You will start seeing more news as we sign third-party deals with brands for retail and other attractions.” But that aspect may be 12 to 18 months down the road. The Resorts World site has been a Las Vegas enigma for more than a decade. The location was home to the once-mob influenced Stardust, which Boyd Gaming Corp. imploded in 2007 to make way for Echelon, a $4.8 billion multiple-hotel complex covering 87 acres – the Stardust site plus additional land acquired by the company. The recession killed that project early in construction, and it sat as an eyesore until Genting bought the site in March 2013 for $350 million. The company announced the deal in a well-attended press conference that included Genting’s leadership, several elected officials, and a number of Las Vegas business leaders. Nevada gaming regulators awarded Genting a preliminary finding of suitability in May 2014. A year later, Genting held an elaborate and colorful ground-breaking ceremony on the site, with the shovel turners surrounded by Chinese lion dancers. In the background stood Echelon’s uncovered steel tower. That tower has now been incorporated into Resorts World. For the last three years, Genting has let the construction do the talking. Levoff said there are roughly 1,000 construction workers on site. By next year, when the interiors are being built out, the company expects to have double that number at work. Genting is active in the U.S through its Resorts World subsidiary. The company said it is spending $400 million to expand its Resorts World New York, a slots-only casino attached to the Aqueduct Racetrack. The expansion, which will open in phases next year, includes a 400-room hotel, restaurants, retail, and additional slot machines, adding to the current mix of 6,000 games. In Miami, Genting is renovating the Hilton Miami Downtown Hotel “to generate higher spend at the property.” Genting spent $350 million in 2012 to assemble 30 acres with 800 feet of waterfront on Biscayne Bay in downtown Miami for Resorts World Miami. However, casino expansion in Florida stalled and has not been revived. Meanwhile, a Genting subsidiary separate from Resorts World took a $426 million impairment charge on a stalled Indian gaming project. Genting loaned the Mashpee Wampanoag Tribe financing to develop a casino-resort in Taunton, Massachusetts. Genting said it was uncertain it could recover its investment in that property after the U.S. Department of Interior said the tribe did not satisfy conditions under the Indian Reorganization Act of 1934 to take the land for the casino into trust. The company is currently working with the tribe on options which “include a legislation being introduced in the U.S. Congress” that could reverse the Interior Department’s ruling. “This impairment loss can be reversed when the notes are assessed to be recoverable,” Genting said. For Resorts World Las Vegas, however, development is steady and quiet.